Last week we launched two new Story Circles with the U.S Department of Agriculture/Agriculture Research Service (USDA/ARS). Story Circles is past the experimental phase of last spring and is now operational. 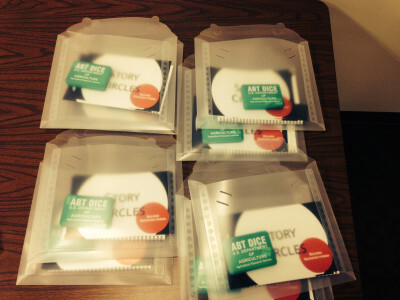 STORY CIRCLES KITS. This is where the training begins, including the new ABT Dice. Last spring we developed our Story Circles Narrative Fitness Training, running four prototypes at three locations. They ran surprisingly smoothly with only a few bumps to iron out over the summer. Of all the locations, the one that emerged as the best was with the U.S. Department of Agriculture in their Agricultural Research Services program (ARS). Specifically, their Office of Scientific Quality Research (OSQR, they call it Oscar) is heading up the effort. They are the folks with the greatest vested interest in improving the narrative quality of their project proposals (called Project Plans). They, more than any other group, quickly took to Story Circles. Now we’ve moved out of the development phase — Story Circles is now operational. We just launched two new Story Circles with the southeast region of USDA/ARS — one “local” with five research scientists at their Fort Pierce, Florida research station, the other “remote” — five research scientists from several other locations who will hold their sessions via teleconferencing which will be the first time for this. I was in Ft. Pierce last week to run the one day orientation session for both Circles. Unlike last spring, where it felt like we were making things up as we went along, now it is feeling firmly established. It works, it’s relatively simple, and now it’s up to the participants to put in the effort to make it effective. If there’s one thing we learned from the prototypes, it’s that you get back what you put in. The harder people worked on the materials, the deeper the feel for narrative structure they gained. There are several other government agencies now talking to me about introducing Story Circles to their employees. It looks like USDA/ARS will be the model for all the others.